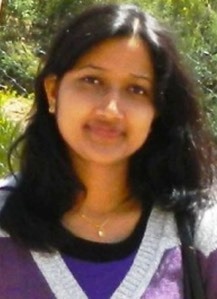 I am Supriya Saha, originally from India and did my Ph. D. in Visva-Bharati University, Santiniketan, India in the field of Computational Material Science. During my Ph.D, I worked on the electronic structure of semiconductor nanoparticles of different forms such as nanowire, nanotubes, QDs etc. In this particular project we have developed a complete set of self-consistent charge density-functionaltight-binding (SCC-DFTB) parameters for zinc-chalcogenides (Zn X ; X = O, S, Se and Te) and their interaction with C, N, and H. By using this parameter set we have explored the role of size, shape and surface passivated groups in tuning the electronic energy levels of ZnO and ZnO/ZnS core/shell quantum dots (QDs) to develop the novel nanostructures with desired properties and specific applications. We have also studied the electronic structure of ZnO/ZnS core/shell NW as a function of core diameter and shell thicknesses and its interaction with Anthraquinone dye molecule to understand the suitability of this nanocomposite system in solar cell. The electronic structure for interaction of different nucleotide bases with different ZnO nanoparticles has also been explored to understand about the site specificity of the nucleobases with different ZnO nanoparticles. 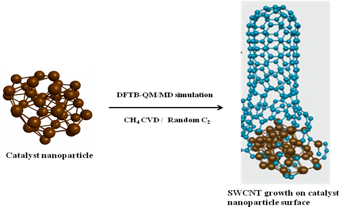 My postdoctoral research project focuses on the investigation of selective carbon nanotube growth using density-functional tight-binding (DFTB) method based non-equilibrium quantum mechanical molecular dynamics (QM/MD) simulation. Our motivation is to choose a suitable catalyst for chirality and diameter selective growth of single wall carbon natube (SWCNT). We choose different bimetallic compounds based on Fe, Co, and Ni as a catalyst. Primarily I am developing the SCC-DFTB parameter set for these bimetallic systems as yet these parameters are not available. The effect of magnetic moment of these transition metals on the growth dynamics of SWCNTs will also be focus of our study. I am also exploring the SWCNT nucleation on the surface of Al2O3 nanoparticle by chemical vapor deposition (CVD) of CH4 with an aim to find out a more suitable catalyst towards chirality-controlle SWCNT growth.